I really don’t want to put specific images in peoples minds — other than written descriptions — because readers’ imaginations will supply the necessary character image as they read. However, I wanted to share the picture that inspired me to write Tom’s character in SYN IN THE CITY. As the young werewolf who becomes Cara’s familiar I wanted someone who was old enough have a romantic relationship, but who was also young and vulnerable. As I conceptualize a character I sometimes want a visual reminder to keep me focused on their individual personalities and looks. The picture, along with a character profile becomes part of the novel guidebook I put together to help me keep track of who, what, where, and when of the various aspects of the story. This is especially important with a series to ensure continuity of facts to tie the books together. 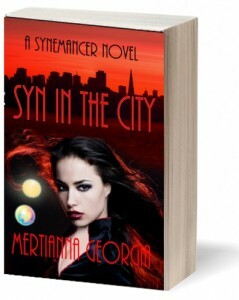 I’m nearly done writing the next Synemancer novel, ANGEL OF SYN. I find having a guidebook is an essential memory aid. So Tom will continue to have copper-penny eyes, blond surfer-dude good looks, and that touch of vulnerability that makes the heroine want to wrap her arms around his warm body and just hold on to him.